Now that the we've all survived the Mayan Apocalypse and are cruising through the first few days of 2013, here's a simple post to kick off the new year. One thing I've had to do several times is import a logo into a the title block on a drawing. The process is straight forward, and dare I say easy. As a matter fact (insert squinty eyes), it's too easy. 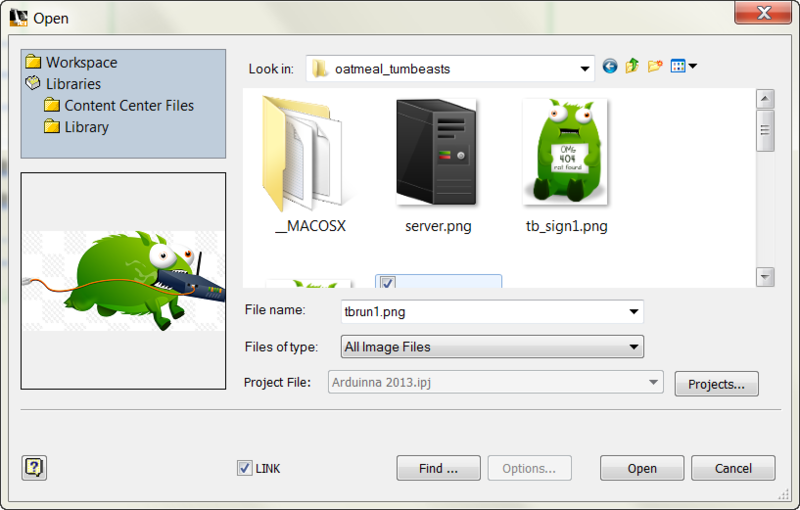 The danger is that by default, the image is actually linked into the file. Not embedded. Personally, I hate linking the image to the title block. In my experience, it seems like the image gets lost, or there are multiple copies of the linked image floating around, inevitably causing what could be a minor data management nuisance to a full fledged headache! Just imagine using Vault with Unique File Names Enforced, and being unable to check in a file because there's already a file named "logo.bmp"! Needless to say, I always embed my logos. I find it works a lot easier for me in the long run. So in this post, I'll go over the steps to insert a logo into the title block, and the step that makes sure the logo is embedded instead of linked. First, edit the definition of the title block by right clicking on it in the browser, and choosing "Edit Definition". Editing the definition of the title block. Now the Sketch Ribbon becomes active. Click on the "Image" icon to insert an image. The next step is to draw a rectangle where the image will reside. A dialog box will appear asking you to select the image to insert. This is the point where it pays to stop and look at the dialog box. Notice the "Link" checkbox? It's checked by default! The link box. I uncheck this. If left checked, the image will link from it's current location. That means the image must always be accessible by the file, and cannot be moved, deleted, etc. This is why I've always preferred to embed the image. By unchecking the "Link" box, the image will now embed in the document, instead of linking. Now it doesn't matter what happens to the original image. The title block carries the image with it in the document from this point forward. 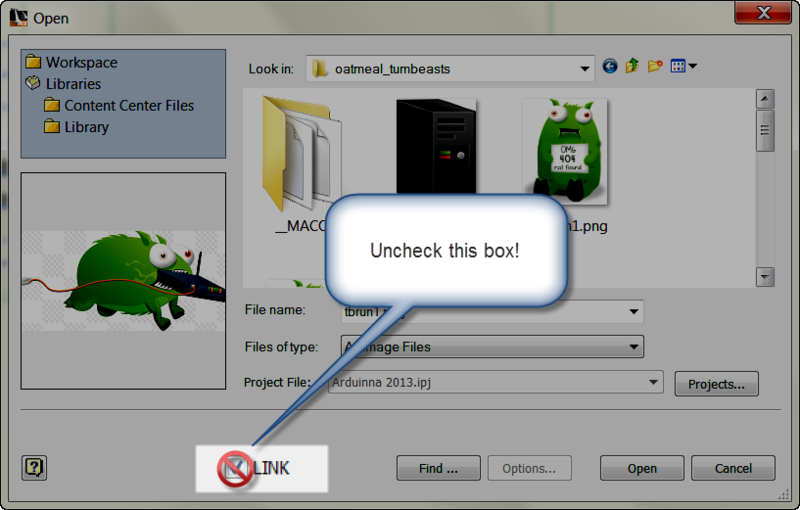 There are the steps to insert an image, with that vital stumbling block of the link checkbox. Watch out for that step. It's a doozy! And out of my curiosity, and that of everyone out in the 'Verse, is anyone out there prefer to link the image instead of embed it? Throw out a comment below. I'd love to see how you're making it work! If you agree with embedding the image. Throw a comment too! I'm a curious soul, and I always like to see who is doing what! For a long time now I've had issues with Embedded logos in title blocks and DWG drawing borders not being able to check into Vault. It seems the image gets replicated and called for example: "logo" becomes "logo1" , then "logo2" etc and vault can't check it in as the file doesn't exist. Its very odd behaviour, which doesn't seem to occur with IDW files. So saving as IDW is a workaround, but not a solution if you want to use DWG. You would then have to use linking to a standard folder in the vault. This has its own issues when doing vault tasks like "get" and copy design when needing to find associated documentation - vault finds all the hundreds of drawings using that linked image. I agree with you on this one. We started out linking our logo into the file, only because we did not know any better. Did not take long to learn from our mistake and corrected the linking to embedding. Dan, sounds like the files were still linking. I've got some embedded images that I've been using in Inventor dwgs since 2011 or 2012 (can't remember exactly when now), and haven't hit that particular issue. But you're solution is definitely a valid one. I know of a few users who will convert an image to a dwg before embedding an image! I think everyone has mistakenly linked an image and faced the consequences! Myself included. Personally, I'm hard pressed to find a reason to link an image into a drawing. I've never cared for it. The only thing I've heard is "what happens if the logo changes? It sill sounds to me like a lot of headache for marginal gain! I work in a drawing office that for the past 10 years has inserted all drawing borders (including title block) as an xref in paperspace. Over those years the company logo as well as address/contact details has changed several times. All that was required to update this was to update the 5 source drawings (1 for each size), and any of the 20.000 drawings opened by a user from that day on had the updated logo and details. This has worked an absolute treat, and is in use by a whole bunch of AutoCAD veterans who quite often don't even understand the concept of Xrefs. Luckily they don't have to understand it, it's set up for them and it's just 'there'. As long as they bind it before transmitting, all is well. These same AutoCAD veterans really struggle with the concept that in Inventor, a washer is a single file that is consumed by 20.000 other assemblies and drawings (no different to our drawing border). In their mind, a washer (like a block) is embedded in the drawing file. If the washer needs to change in size, they edit the block, instead of replace it with a different block with a different size. A perfectly valid AutoCAD mindset. If they had the option, they would rather bind this washer and any other component into the assembly, making the assembly a single standalone file, making Inventor work just like AutoCAD. Us experienced Inventor users know this is very silly. We're smart, we now that a single washer is a single part file consumed by 20.000 assemblies and have no problem with that concept. In fact, we think the concept is brilliant; Change the part number, or change the item description, or the color, etc etc., and all 20.000 assemblies magically update. That's where the power of 3D design really shines. But now, here we are, saying that when it comes to a company (or any other kind of) logo, it should be bound into the drawing file because, well, it just 'works' better. It will never go missing, and Vault won't chuck a hissy fit if you named it 'logo.bmp' and can't get it to load due to naming conflicts. Us clever inventor users know that linking images is a silly idea. It's the world in reverse! I once had an experienced Inventor user create some drawing templates for me in Inventor. He made one template file for each sheet size, and inserted the company logo as a bitmap. Each template was 2.5 MB in size, mainly because the bitmap he inserted was huge. When questioning him about it he told me 'that's just how Inventor works', file sizes are bigger in Inventor. I simply couldn't except this, and I threw those templates in the bin, instead inserting a vectorized company logo into the border greatly reducing the size, and as a bonus looks great when converting to AutoCAD. Now, that still gives me an entirely standalone title block in each and every drawing that I make, only updateable by running some batch process through Drawing Resource Transfer Wizzard, which I'm hoping I'll never have to use in my lifetime. But hey, that's just how Inventor works! Ps: Yes, I have requested to Autodesk directly to implement something that allows you to insert Drawing borders and title blocks from a single library location, managed and updateable by an admin, and consumed by a drawing office full of Inventor users. In my experience, our borders and title block rarely changed, so there was only a marginal gain in Xreffing. Even in AutoCAD we moved away from it. But with every rule, there is an exception. Out of curiosity, have you ever considered using the Inventor dwg and linking the border in using the same mechanism as you did in AutoCAD? I know it’s a seemingly insignificant thing, just build a bridge and get over it right? Bind the logo and move on, nothing else to see here. There’s just a few too many of those little things in Inventor to my liking that you simply have to accept because it’s the way it is. We do use the Inventor.dwg format, as I like its benefits over idw when it comes to opening in AutoCAD, and taking blocks from there over to native AutoCAD drawings. I tried your suggestion to see if there’s a way to xref an existing Autocad drawing border into an Inventor.dwg drawing sheet, but this doesn’t seem to be possible. Inventor.dwg doesn’t understand xrefs. Even if it was somehow possible (save Inventor.dwg in Inventor, open in AutoCAD and insert xref in paperspace, then add to Inventor templates folder? ), I don’t think I’d want to go down that path, it’s too much of a Frankenstein implementation. I’d rather stay with native Inventor functionality and work around its limitations until proper functionality resolves it. Another similar gripe is with the drawing resources. 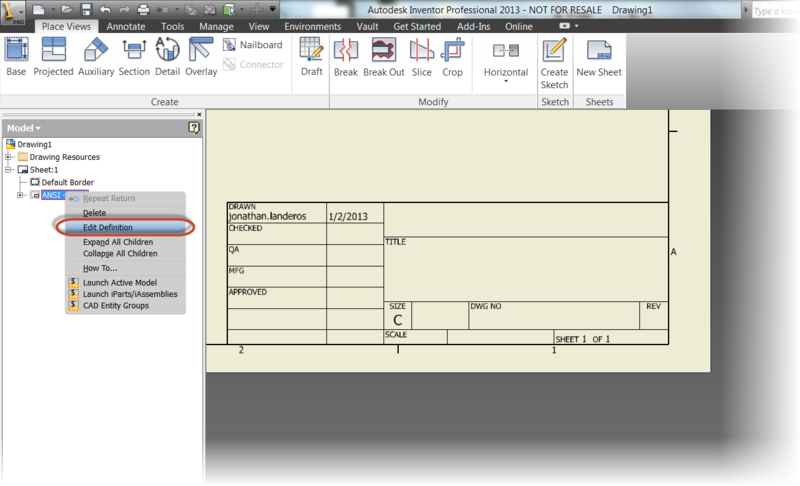 In AutoCAD, I can assemble a toolpalette with standard content (blocks for standard notes and tables for example). This content is all linked to a single source file on the network. At any time I can make an update to any block, and instantly the user will be inserting the most up-to-date content from that day on. Of course, drawings made up to that point will still contain out-of-date blocks, but only the ones used. In Inventor, all standard content that could possibly be required on a drawing needs to be loaded up (embedded) in the drawing template. That means each and every drawing created will contain a complete library of content, local to the drawing file, with only a small percentage actually in use in the drawing. All of this content will take up space and go out of date as changes to the template are made. As these drawings are copied over with design variations, their out-of-date drawing resources are continuously brought along, with the user not knowing what’s out-dated and what’s not. What options are there? Ask every user to purge all unused drawing resources once the drawing’s completed? Nobody can be bothered to do that. Alternatively, have one template containing the bare essentials, and another template containing all drawing resources, and ask the user to copy/paste the resources they need? Again, not a workaround that will be met with a lot of enthusiasm. The solution I would prefer would be to have something like AutoCAD’s toolpalette, or some other library-based drawing resources area that can be managed by an administrator and consumed by users when needed. It could even be a background implementation; set your preferred location in the options pointing to the drawing resources (similar to templates and style libraries), and these will automatically appear in every drawing you open, with the user unable to even tell what’s local to the drawing file and what’s library based (although separating the different categories would be a good idea). Last, you say that you stopped xreffing borders in AutoCAD and instead inserted them, because they simply wouldn’t change at all. But what downsides did xrefs have to not use them? If there is one thing that is always the same, and will never change, wouldn’t it make sense to use it just once and consume via xref wherever required? Users can’t modify it even if they tried, and whatever space this drawing border/titleblock takes up, isn’t multiplied by tens of thousands. Our border and logo ads 50kb to the file size of a drawing. Let’s say we have 20.000 drawings with on average 5 drawing sheets. That would be 5GB of border and logo geometry stored in embedded in drawings on a network drive, whereas now this is just 250kb of geometry, uneditable by users and certified identical across the board. Now consider instead of 50kb of drawing geometry, 2.5 MB of embedded bitmap, and 20.000 drawings; ouch! I can see why you’d want to embed an image rather than link it, Vault is just not made to manage pictures. But just like Dan my recommendation is to forget images altogether and vectorize where possible and insert linework instead, especially if it is your own company logo. I have used embedded images for logos in client borders, vectorizing was just too complex and time consuming. I can understand your reasons for certain. It may be a matter of just two different approaches. Back when I crossed the embed vs xref bridge, the users I worked with weren't very good at xrefs (even though Inventor uses an xref mechanism). We also didn't have a lot of control over our folder structures, as that was essentially created for us, and we were told "don't worry about it". As a result we tended to constantly see xrefs get changed when they shouldn't have, deleted, moved, inserted from someone's local drive, etc. As a result, a lot of time was lost fixing these. A few of us "benevolent rogues" began embedding things in the files to protect our work from the "zombie apocalypse of the CAD department". The strength of XREFS had become their weekness. The power to affect a sweeping change quickly was like giving the Joker the launch codes to a nuclear arsenal. As I moved to Mechanical Desktop, and ultimately Inventor, things were moved locally and embedded. The benevolent rogues had effectively built a bunker that protected them from the zombies at the gate. In the end, this became the method i preferred. Borders didn't change enough to see any real benefit to being able to change them. File size never became a big enough issue to warrant a need to reduce it, and manage the xrefs. Tool palettes were never used, so combined with the lack of pain regarding filesize etc, there was never a compelling reason to use them. Even to day as I've moved on, I've never hit a pain point that would cause me a need to change what I've done. It may just be a matter of different experiences in different environments resulting in different approaches. One of those cases where "there is no right or wrong answer, only what's right or wrong for the individual". The main reason we 'Link" vs. "Embed" is operational. We have about 20 users and all work out of Vault. We mostly use xrefs as we did when we used AutoCad, so we have an "xrefs" folder in vault. They are mostly customer title blocks & logos which we insert into our drawings and Professional Engineer stamps which we have in all 50 states. In order to control these we prefer placing them in Vault so everyone can "get" but not modify them. This is how we maintain some semblance of document control with going to Adept or some other doc manangemant system outside of the free version of vault. If, as we do, you are going to save ("save copy as") your idw's to autocad.dwg's, make sure your default image program is set to Windows Paint. Otherwise, your bmp image won't show up in your autocad drawing. After a few hours trying to figure out why our .bmp logo, although fine in .idw's, was showing up in autocad as a white box with "tempembed.bmp" text, I found a post buried on the autodesk forums that led to this fix. After I changed default to Windows Paint, I "saved copy" our logo.bmp, inserted in to our border template, and now it opens up just fine in Autocad. And if it matters, we embed, since we have to hand our drawings over to our customers. Good point, Mel. I haven't run into the Windows Paint issue in quite a while now, but that is something that can cause grief! BTW, I was mistaken, we don't embed our logo.bmp in our IDW's, we link it. Too many copies of logo.bmp if we embed. Our logo is very difficult to recreate as Autocad entities, which is why we use a .bmp in the first place. Ok, sorry for cluttering up your blog with my erroneous comments....we DO embed. Linking it creates all the extra copies of the logo.bmp, which is not what we want, in our office anyways. I also embedded a logo and works fine but when i'm finished with a drawing i always make a DXF file also with the savecopyas. When i do this the logo is not there anymore. Does anybody knows whats wrong. 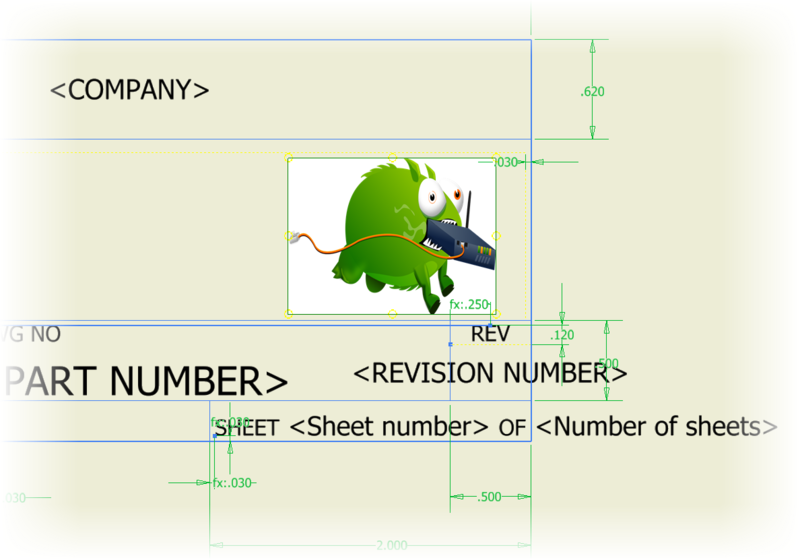 Autocad DXF drawing shows a small tekst with TempEmbed.bmp. I had the same problem, in my case happened because the image resolution was too high. To reduce it you can use a simple software like Paint (resize command). Sorry but I don't know the exact maximum size, around 1000 pixels in lenght should be fine. Thanks for your blog Jonathan. Just ran into an issue, and hope I can save someone some time. I was updating the image in my title block, and forgot to uncheck that link box. No big deal. I deleted the image and re-inserted it remembering to uncheck the link box. When I went to check in the drawing to vault, it the image was still linked. After a number of attempts I found the solution on a forum, and thought I would share. Thanks for the tip, James! I'm sure your experience will help someone out! I have inserted an image in my title block. Can I somehow give them a proper dimension? I can not mark its bounding box. It have grid points but I want to align it to my block. There isn't a way I know to do dimension the image directly. You might be able to sketch a rectangle, and use that to size your image. In ipt sketch I can dimension the image, I hoped it is the same in idw.